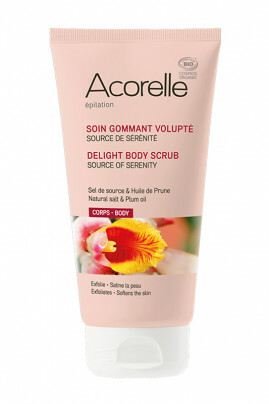 ACORELLE Organic "Source de Sérénity" Scrub gently exfoliates your skin by eliminating dead cells! 100% natural composition, the source salt exfoliates while the plum kernel oil, soya oil and shea butter combo deeply nourishes your skin. On dry skin, its balm texture turns into a delicious oil, perfect for a massage. In contact with water, the oil is then transformed into creamy milk, leaving a delicate oriental scent of orange, jasmine and musk. With Acorelle Organic Voluptuous Exfoliating, your skin is smooth, nourished and silky! A real moment of relaxation at home with ACORELLE Natural Body Scrub! Apply the organic body scrub on dry skin, depending on the desired application, in a circular motion, once or twice a week or the day before epilation. Rinse thoroughly. A little advice: this scrub is a real treatment that can be used before or after epilation. Used the day before epilation, it will allow you to exfoliate and release hair under the skin. After epilation, it will leave your skin soft and nourished as its moisturizing action will replace your classic moisturizer. Store before and after opening, away from light and heat, in a clean, dry environment. A 100% natural composition with ACORELLE Plum Oil Body Scrub! INCI : HELIANTHUS ANNUUS (SUNFLOWER) SEED OIL*, GLYCERIN**, SODIUM CHLORIDE, AQUA (WATER), PRUNUS DOMESTICA SEED POWDER*, PRUNUS DOMESTICA SEED OIL*, GLYCINE SOJA (SOYBEAN) OIL*, BUTYROSPERMUM PARKII BUTTER*, PARFUM (FRAGRANCE), SUCROSE PALMITATE, SUCROSE LAURATE, GLYCERYL BEHENATE, TOCOPHEROL, COUMARIN, GERANIOL.